Left to right: Steve Ramirez of the Picower Institute at MIT, NIMH Director Dr. Tom Insel, and Xu Liu of the Picower Institute at MIT. Photo courtesy of the Smithsonian Institution. 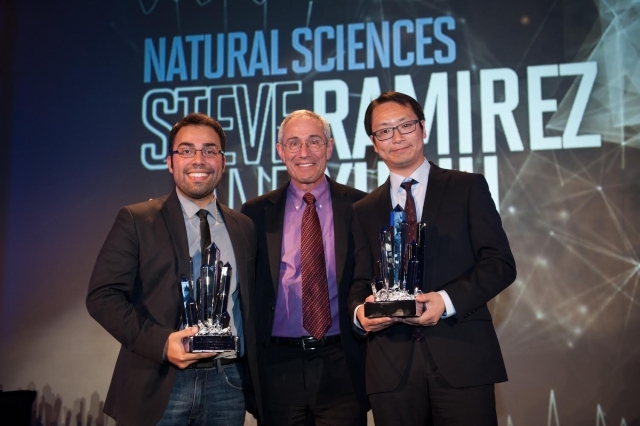 The Picower Institute for Learning and Memory congratulates postdoctoral associate Xu Liu and graduate student Steve Ramirez, both members of Susumu Tonegawa’s Picower lab, who recently received the 2014 Smithsonian American Ingenuity Award in Natural Sciences. Ten awards saluting extraordinary achievements in innovation across nine diverse categories, including performing arts, education, and social progress, were presented at a ceremony on Oct. 16 at the National Portrait Gallery in Washington, D.C. In what is considered a significant breakthrough in neuroscience, Liu and Ramirez documented the ability to not only artificially reactivate specific memories in the brain but also to create false memories. Using optogenetics and lab mice, the two Picower scientists manipulated cells that are activated during formation of fear memories to implant a new memory of an event that never happened. Their work is expected to contribute to new therapeutic treatments for memory-related psychiatric disorders. While many questions remain regarding the safety and ethics of memory modification in humans, the discoveries of these two innovative researchers about the mechanics of memory suggest it may be possible to recover treasured memories lost in those with Alzheimer’s as well as perhaps selectively extinguish harmful memories in those who suffer from ailments such as post-traumatic stress disorder (PTSD). To learn more about the research supporting the selection of Liu and Ramirez for this prestigious award, read the full story in Smithsonian Magazine.